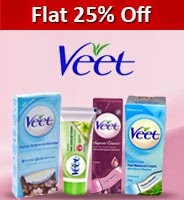 Here you can get 2-4 June FLAT 25% OFF on Beauty and Grooming Products at Great Nykaa. Worth of Rs.599 product can be get it at Just Rs.375 only. Please hurry to take the advantage of this discount offer. Offer Valid till 2-4 June 2014. Enjoy the deal with Beauty and Grooming Products.